Bare Mill Finished Aluminum - Our most economical snow guard. Always available for immediate shipment, mill finish Ice-Brakes blend nicely with white, gray and bare metal roofs. 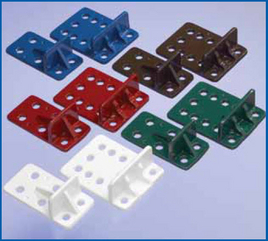 Powder Coated Colors - Ice-Brakes are available in dozens of powder-coated colors to match a variety of roofs. Custom Colors - Custom colors are also available and can be matched to the roof sample you provide. Bronze - IceBrakes cast in bare red bronze are compatible with cooper roof systems. Ice-Brakes are high-quality castings fabricated of durable 319 Alloy Aluminum. Aluminum does not rust or discolor and is galvanically compatible with steel roofing materials. A snow guard should last the life of the roof on which it is installed. Ice-Brakes are guaranteed against breakage for as long as the roof is in place. Ice-Brakes feature a unique pattern of holes specially designed to draw adhesives into "rivets", locking the snow guard in place. Easy to install with no roof penetrations. Adhesive fastening is the method of choice for "floating" roof systems, where mechanical attachment to structural members below the roof can interfere with the natural movement of the roof. 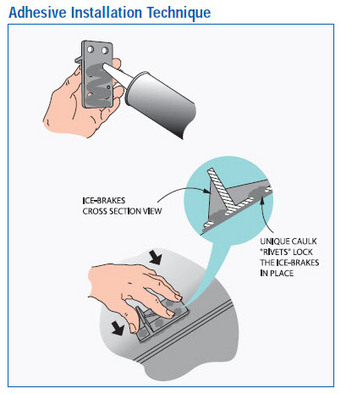 Note: Consult licensed architects, engineers or building officials to judge structural integrity and load capacity before installing IceBrakes. East Coast Roof Specialties and East Cost Lightning Equipment, Inc. are not responsible for determining these factors.